It opened just over a month ago, on 15 October, and although I haven’t found time to go to it, I thought it might be worth mentioning already. I’m talking about the retrospective exhibition of work by Johan Grimonprez entitled It’s a Poor Sort of Memory that Only Works Backwards: On Zapping, Close Encounters and the Commercial Break. The exhibition is being held at S.M.A.K., the Municipal Museum of Contemporary Art in Ghent, until 29 January 2012. Born in Roeselare in Flanders in 1962, Grimonprez is a filmmaker and artist whose video work, I read on the S.M.A.K. website, “manoeuvres graciously between art and cinema, documentary and fiction, practice and theory”. Grimonprez’s most recent work is, I believe, Double Take, a feature film which centres on Hitchcock’s, well, double. What interests me about the exhibition is that it will be an opportunity to see dial H-I-S-T-O-R-Y, the film with which Grimonprez made his international breakthrough at Documenta X in 1997. Using footage from a wide range of factual and fictional sources, the film centres on the televised representation of airplane hijackings and terrorism. Interestingly, I learned that Grimonprez notably drew on Don DeLillo’s 1991 novel Mao II, which explores the role of the writer in a society whose attention can be captured more quickly and more lastingly by acts of terrorism, leaving the writer in DeLillo’s book wondering what his place is in such a society. And then it struck me that Mao II is also, of course, a novel with pictures in it, although I had never thought of it as such. The above is a film still from dial H-I-S-T-O-R-Y which I borrowed from the S.M.A.K website. 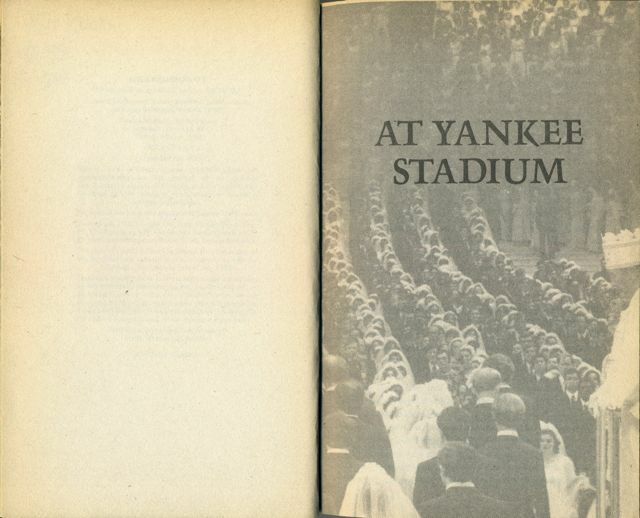 Although I don’t have the precise identification of the above picture, it seems to be a colour version of the picture of the mass Moon wedding at Yankee Stadium with which the first chapter of DeLillo’s novel opens (the picture below is taken from the 1992 Vintage paperback edition). Besides the above photograph, DeLillo’s novel features four other pictures, of a mass demonstration on Tiananmen Square, of the Hillsborough football tragedy, of the Ayatollah Khomeini in Tehran, and of some young boys in Beirut. Each of the pictures is placed at the opening of a chapter, except for the Tiananmen picture which opens the novel. As such, they might be seen as illustrations to the novel rather than pictures that are an integral part of the novel. There may be some truth to that, but I prefer to think of them as being as much a part of the novel as the text. This entry was posted in Don DeLillo, Johan Grimonprez, Picture novels and tagged dial H-I-S-T-O-R-Y, Don DeLillo, Johan Grimonprez, Mao II, picture novels, S.M.A.K.. Bookmark the permalink.